When it comes to aesthetic interventions, injection of Botox or botulinum toxin is the most common cosmetic procedure performed today. The American Society of Plastic Surgeons estimates that in 2014 nearly seven million people received botulinum toxin injections. To put that number into better perspective, seven million is nearly the population of Arizona. Most people associate botulinum toxin injections with the treatment of wrinkles; however, this remarkable agent is extremely versatile and used for many other conditions, including spasticity, eye twitch (i.e., blepharospasm), neck contracture (i.e., cervical dystonia), migraines, and overactive bladder. Botox is also used for the treatment of severe underarm sweating (i.e., hyperhidrosis). The story of how we came to inject this microbial toxin into our bodies to treat wrinkles is both fascinating and serendipitous. Botox or botulinum toxin is produced by the bacterium Clostridium botulinum. In the wild, infection with Clostridium botulinum causes botulism, a rare but disabling paralytic illness. Botulism starts by paralyzing the muscles of the face, mouth, and throat before spreading to the rest of the body. When botulism paralyzes the muscles used in breathing, death can ensue. Of note, in May 2017, there was a botulism outbreak in California traced back to nacho cheese sauce sold at a gas station. As a result, 10 people were hospitalized and one person died. Although Clostridium botulinum comes in several strains—eight serotypes A, B, C1, C2, D, E, F, and G—only serotypes A and B are used to create clinical preparations. After injection into the muscle, botulinum toxin suffuses the nerve terminal and binds thus preventing release of acetylcholine, a neurotransmitter. Without acetylcholine, muscle activity stops. This focal, or site-specific, paralysis is what smoothes wrinkles and stops spasms. In other words, Botox works by "paralyzing" the wrinkles away. In addition to interfering with acetylcholine release, botulinum toxin also interferes with the release of pain and inflammatory mediators including substance P and glutamine, which explains why botulinum toxin is used to treat migraine headaches. 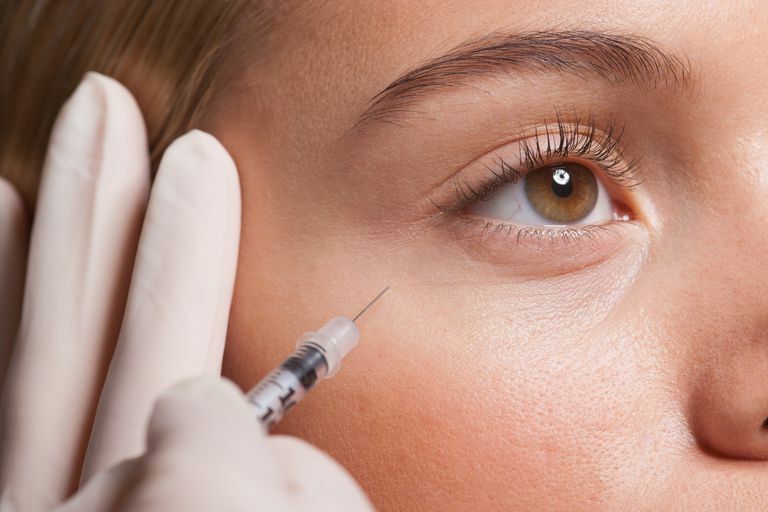 Adverse effects after treatment with botulinum toxin include bruising, swelling, headaches, discomfort as well as muscle weakness which may affect muscles surrounding the muscle that was injected. Before injection with botulinum toxin, use of anticoagulants should be discontinued for two weeks to minimize bruising. Pain at the injection site can be minimized with use of a small-gauge needle, application of a topical anesthetic or icing the area before injection. Furthermore, treatment with botulinum toxin should be started at a lower dose and gradually increased. The effects of botulinum toxin wear off during time. Specifically after initial chemical de-nervation, the nerve ends sprout or regenerate and functionality is restored after 120 days. In other words, after altering nerve ending, Botox works for about 120 days before the nerves regenerate. This restored functionality of nerve endings explains why people sometimes get serial treatments in the same spots. There is no generic version of botulinum toxin, with several formulations on the market including Botox and Dysport. These formulations are not interchangeable and are dosed differently. These separate iterations of botulinum toxin vary by molecular weight, excipients (i.e., drug medium), and complexing proteins. Clostridium botulinum was first discovered by a Belgian scientist named Emile Pierre van Ermengem following a botulism outbreak in Belgium. By the 1920s, scientists at the University of California, San Francisco, first tried to isolate the botulinum toxin. However, it took 20 years before the botulinum toxin was finally isolated in crystalline form by Dr. Edward Schantz. In the 1970s, scientists started using botulinum toxin to treat strabismus (i.e., crossed eyes). While testing this treatment on monkeys, researchers noticed that botulinum toxin reduced wrinkles in the glabella. The glabella is the skin between the eyebrows and above the nose. After botulinum toxin proved successful in the treatment of strabismus, Allergan licensed the treatment and branded it Botox. Subsequently, Botox received FDA approval for a variety of medical and cosmetic uses. Please note that although physicians use botulinum toxin to treat many types of facial wrinkles, much of this treatment is off label. In other words, your physician uses clinical judgment to treat facial wrinkles with Botox. In the annals of medicine, botulinum toxin is probably most notable because it was the first microbial injection used to treat disease. The injection of bacterial products into the human body represents a new invention. With each passing year, researchers develop more formulations of this versatile agent and find more uses for it. Botox is a versatile agent commonly used to treat many types of wrinkles. Overall, the use of Botox is relatively safe, with few adverse effects. If interested in receiving Botox treatments, please speak with your dermatologist. Camargo, CP, et al. Botulinum toxin for facial wrinkles (Protocol). Cochrane Library. 2014. Dorizas, A, Krueger, N, Sadick, NS. Aesthetic Uses of the Botulinum Toxin. Dermatologic Clinics. 2014; 32(1):23-36.